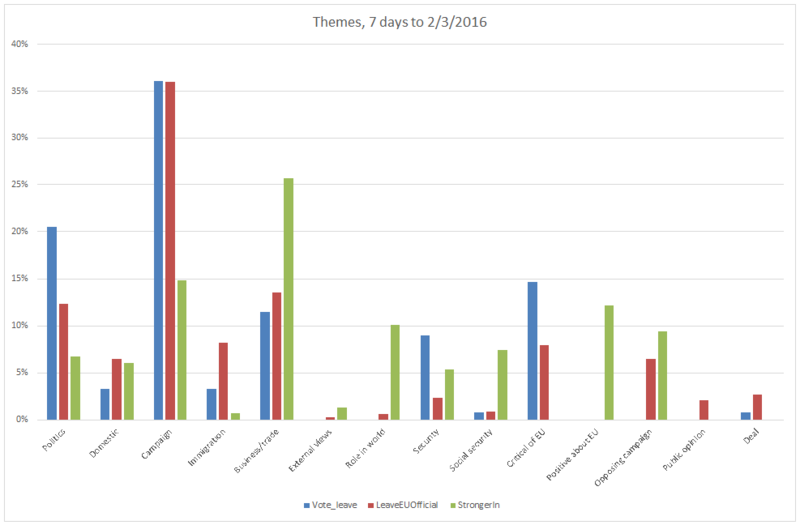 What the #EUref campaigns say: 4 March 2016 – Does negative campaigning really work? After last week’s big push online to try and control the presentation of David Cameron’s European Council deal and the subsequent launching of the hot phase of the referendum campaign, things have settled down this week in the EU referendum tweeter-sphere. We can see this in a number of areas. Firstly, last week’s big growth in followers of official group accounts (17.6%) has not followed through to this week (7.4% in the seven days to 2nd March). While this still leaves Leave.EU far ahead of the rest, its growth has been only 1/2-1/3 that of either Vote Leave or StrongerIn, suggesting either that Leave.EU is approaching a saturation point, or that momentum in its online presence is weakening. However, this is only going to become clearer as we move into the formal phase of the campaign and the point where official campaign group designations are handing out by the Electoral Commission. It’s also worth noting that Conservative Reform in Europe has now closed its account, so ConservativeIn becomes the main pro-membership group aligned next to the party. 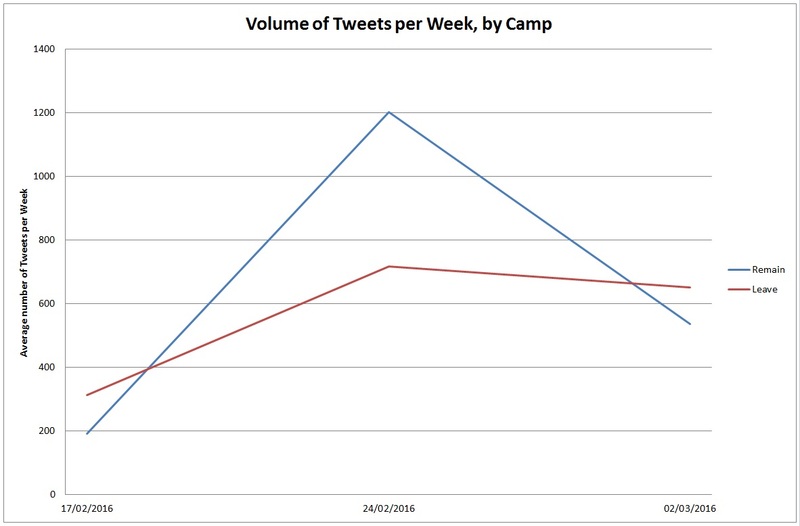 As well as slower growth, groups have also cut back on the volume of their tweeting. This follows an unsurprising path, given the lack of big flash-points during the week, but the generally more-raised profile of the referendum in the media. Last week, we noted that there was a noticeable difference in the average number of retweets and favourites per tweet between the different groups. 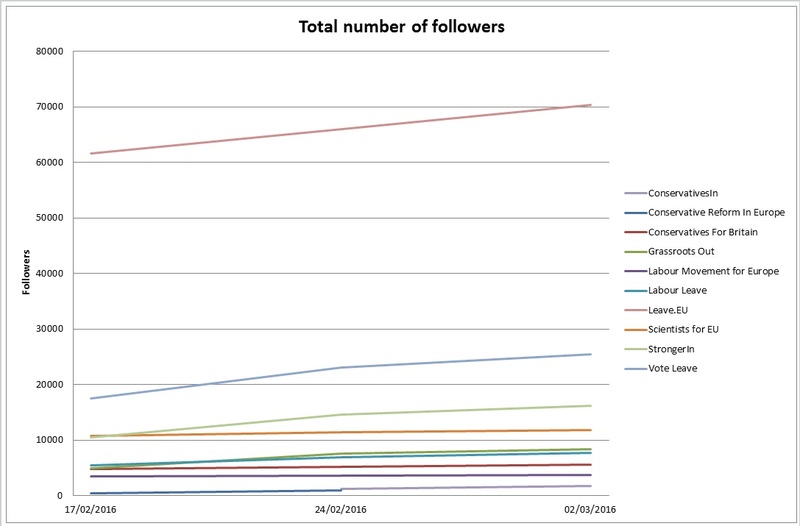 Further analysis this week, which takes account of the differences in the number of followers, confirms this point: If we take the period between 3 February and 2 March, then we can see that the Remain have a somewhat better rate of retweets, while Leave have a stronger favouriting profile. 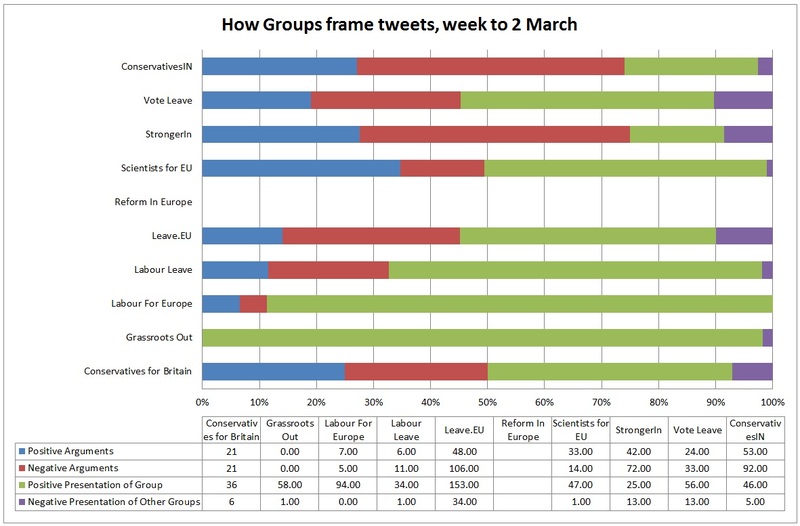 Since retweeting will reproduce the tweet on another timeline, whereas favouriting does not, this would seem to give the Remain groups a slight advantage, although it is more than offset by the difference in followers (roughly 3 to 1 in Leave’s favour). 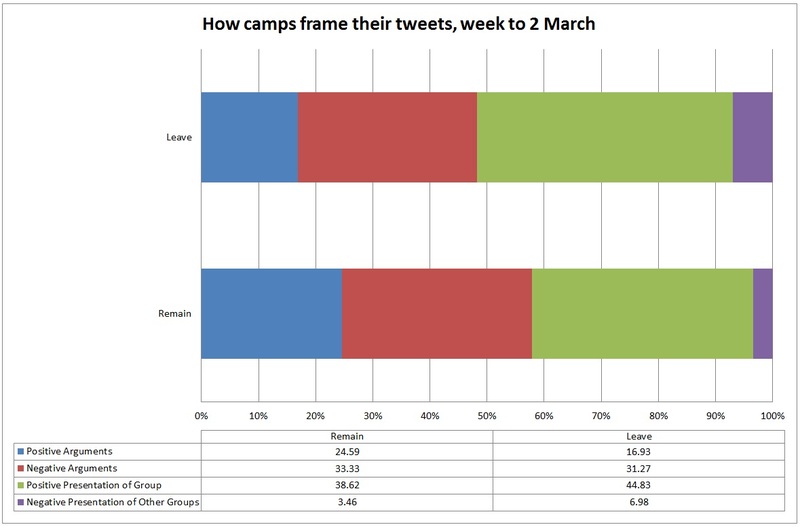 Turning to framing, we can see a broadly consistent profile to previous weeks: the Remain camp more positive in their presentation of arguments, while Leave devote more tweets to talking up their group(s) and attacking Remainers. A big part of this last category was taken by challenges to StrongerIn’s chair Stuart Rose, about his comments this week on EU membership keeping down wages. If there is anything to note, then it is the slow emergence of a declining trend in the percentage of positively-framed tweets. 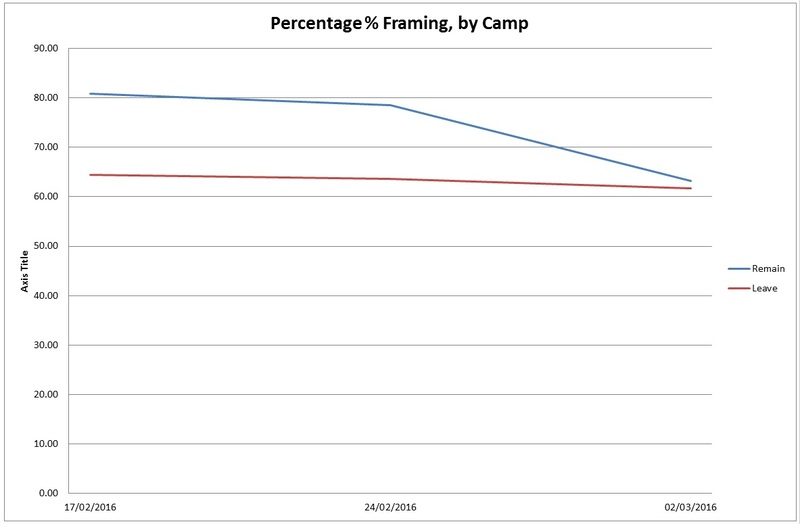 While this remains high, at around 62-3% on both sides, that does still mark a deterioration from a fortnight ago. That this seem to be much more of an issue on the Remain side, it will be interesting to see whether the current debates around Project Fear/Project Fact have any impact in arresting this in the coming weeks. As groups consider their strategies, they might consider our findings from the previous month. Between 3 February and 2 March, we captured data across all the groups, to see if positively- or negatively-framed tweets got more traction (as expressed through retweets and favourites). Contrary to much popular wisdom, we found that the picture was much more mixed. 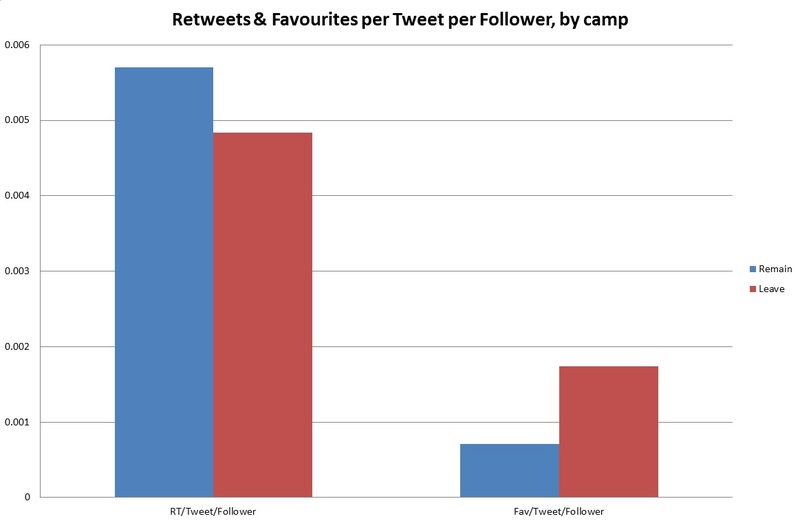 Tweets about positive arguments are most likely to be retweeted and/or favourited. 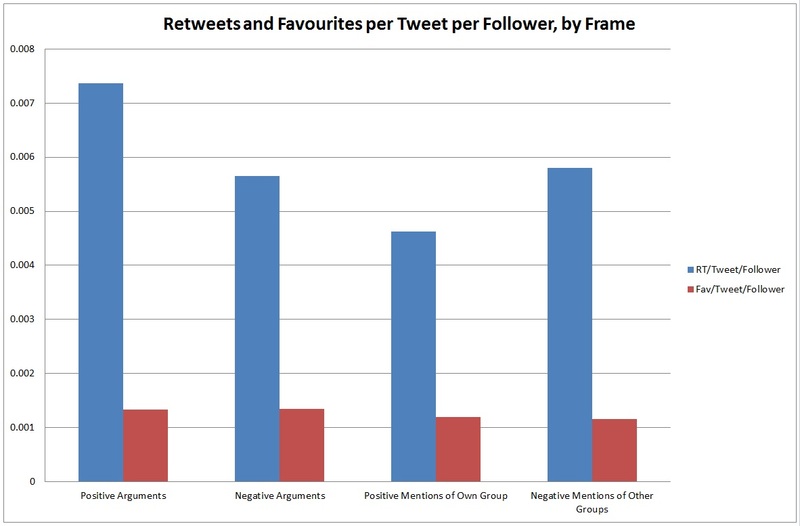 Negative mentions of other groups and negative arguments are clearly less less likely to be retweeted, with positive mentions of one’s own group bringing up the rear. This last category can be understood by the substantial number of tweets that just talk about a local campaign event that has already happened (which might be of limited interest to a wider audience). However, the strong result for positive arguments does seem to suggest that there is some scope for achieving more profile with followers. As part of understanding this, we will be looking to see if further patterns can be drawn out of the data. This week’s analysis look at the key themes and issues being tweeted about by the three main campaigns, Vote Leave, Leave.EU and StrongerIn. Last week details of Cameron’s deal were prominent among tweets from all three campaigns, this week that had receded from prominence with only the leave campaigns making minimal references to it (Vote Leave, 1% and StrongerIn, 3%). All the campaigns dedicate a large proportion of their tweets to campaign related issues, these include tweets about campaign events and particular promotions (e.g. twibbons, mailing lists, films). Nevertheless, the two leave campaigns devote significantly more tweets to this area (36%) compared to StrongerIn (15%), suggesting they are competing against each other to build a campaign base. Issues related to business, trade and the economy continue to feature prominently in tweets from all the main campaigns, although StrongerIn produced the most tweets on this theme (26% compared to Vote Leave, 11% and Leave.EU, 14%). Following the letter by Military Leaders last week supporting Britain remaining in the EU, we see security emerging as a more prominent theme. Vote Leave in particular has sought to engage on this issue and has make that case that Brexit would not impact Britain’s security. Immigration features in all campaigns but most prominently in the Leave.EU and then Vote Leave twitter feeds. Issues related to social security are not being engaged with by the leave campaigns, however, StrongerIn is focusing on the issue, in particular maternity and paternity rights. This is perhaps indicative of the sources they use – The Evening Standard and Sky News – and their positons on the EU Referendum and is certainly interesting that the same report can be interpreted as in support of both remain and leave.